“Scattered Rhymes.” Tarik O’REGAN: Scattered Rhymes* (2006); Virelai: Douce dame jolie (2007). Guillaume de MACHAUT: Messe de Nostre Dame (early 1360s); Douce dame jolie. Guillaume DUFAY: Ave Regina celorum (1463). Gavin BRYARS: Super flumina (2000). The Orlando Consort: Robert Harre-Jones (cntrten), Mark Dobell, Angus Smith (ten), Donald Greig (bar), with Robert Macdonald (bs); *also The Estonian Philharmonic Chamber Choir, Paul Hillier (dir.). 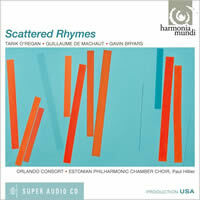 Harmonia Mundi HMU 807469 (hybrid multi-channel SACD) (http://www.harmoniamundi.com/). This Orlando Consort disc interleaves Medieval works (its usual beat) and current efforts that refer to them. The Olde part is reliably compelling. I’d rather hear Machaut’s Mass in the context of a whole service than as a five-movement symphony plus coda, but such polished singing provides a blueprint for the edifice. Ave Regina celorum is wrenchingly personal (Dufay twice inserts his name) and gorgeously intoned (in tone). Next to these, the new stuff lies beneath discussion. Guillaume DUFAY: Quadrivium: Motets, vol. 1. Cantica Symphonia, Giuseppe Maletto (dir.). Glossa Platinum GCD P31901 (http://www.glossamusic.com/). Distributed in the US by Qualiton (http://www.qualiton.com/). Dufay as Monteverdi (only two centuries off). 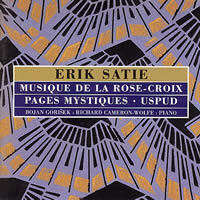 “Musique de la rose-croix, Pages mystiques, Uspud.” Erik SATIE: Trois sonneries de la rose + croix (1892); Première pensée rose + croix (1891); Deux préludes du nazaréen (1892); Prélude de la porte héroïque du ciel (1894); Prière (1893); Vexations (1893); Harmonies (c. 1893); Le fils des étoiles (1891); Uspud* (1892). Bojan Gorišek, Richard Cameron-Wolfe* (pno). LTM LTMCD 2469 (2 CDs) (http://www.ltmrecordings.com/). Distributed in the US by Darla Records (http://www.darla.com/). Immobile yet standing outside its era, Satie’s strange early output goes far beyond the later whimsies. His flirtation with self-styled Rosicrucian Joséphin Péladan’s sect produced a Medieval piano album — severe fanfares, marches and stage music for group gatherings. Plainchant’s irregular stresses seem a major influence. Gorišek doesn’t scale the mystical heights of Reinbert de Leeuw and Ulrich Gumpert, but harmonies decay slowly. Vexations, done without inflection, fills 22:52. 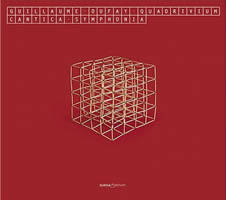 Cameron-Wolfe’s account of the rarely attempted “Christian ballet” Uspud is the strongest element, with focus, instrument and recording superior to the Gorišek tracks. (Narration is added on “Paris-X,” from Furious Artisans.) Several building blocks — delicate fingerings, pregnant suspensions, walking in place, crashing chords — succeed one another in ways that frustrate expectation, and Cameron-Wolfe lends each a definite plateau. He has navigated the 840 plays of Vexations four times. 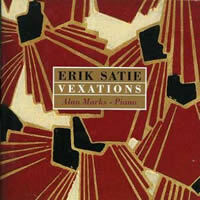 Erik SATIE: Vexations (1893). Alan Marks (pno). LTM LTMCD 2389 (http://www.ltmrecordings.com/). Distributed in the US by Darla Records (http://www.darla.com/). Vexations’ three innocuous lines show careful construction (analyzed here and here). The key point is that pianists can’t find a comfort zone. On this reissue from 1991, Marks made the deepest dent yet preserved, 40 renditions. (It’d take the CD 24 hrs. 23 mins. to reach 840.) Nothing robotic here — he achieved a rich, rounded tone and employed the resources of the notable talent he was (until passing away in 1995 at 46). Once inside, I can easily get lost there.